I know how this looks. I really do. I hesitated to even post this at all, but I went for it in honor of Earth Day for lack of a better reason. Yes, that is a bowl of green goo. It’s something you might find on the Land of the Lost studio floor after a Sleestak scene. Did you know the movie version is coming out in June? I just discovered that fact as I looked for a link to explain Sleestak, and now I can’t wait for June. So, let me explain this soup. We’ve been getting some fresh and gorgeous spring greens from our Hands of the Earth CSA, and yesterday was a pick up day, and I found this recipe, and it sounded good to me. HOE has grown some really beautiful beets, and they deliver them with their perfect greens intact. I’m not sure that beet greens get used very often. Beets sold in grocery stores often have the greens removed, or they’re a little dried out and less than appetizing. Yesterday, Earth Day, the beet greens were pristine, so I cut them off to use them and saved the beets for later. We also received some braising greens including little collard and kale leaves. I was thrilled to use every bit of what we received as best we could, and the trimmings went into the compost as usual. And, that is how to throw an Earth Day party: eat all your greens and make compost. If I haven’t driven you off yet, let me mention the book in which I found this soup. It’s from Potager: Fresh Garden Cooking in the French Style . Potager, or kitchen garden, cooking is necessarily seasonal. The author, Georgeanne Brennan, founded Le Marche which is a seed company specializing in unusual vegetables. This book encourages home gardening or finding fresh, local ingredients. The book is sectioned according to season and offers a range of simple but interesting dishes. There’s a savory bread pudding with asparagus and fontina that I have bookmarked, and for summer, rosemary pizzas and charred eggplant sandwiches with aioli sound amazing. This soup was very easy to prepare, and I hope I can convince you to consider trying it. 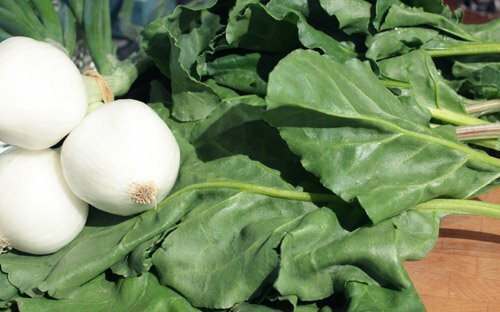 Two pounds of greens were cleaned and roughly chopped and then sauteed with onion in olive oil. Once the greens were limp, they were added with their juices to a blender pitcher with a half cup of vegetable broth. This was pureed and returned to a large saucepan. An additional cup and a half of broth was stirred into the puree. Meanwhile, store-bought gnocchi were boiled separately. 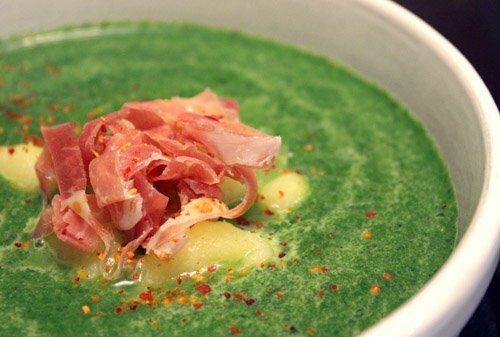 To serve, ladle soup into bowls, add gnocchi, top with grated pecorino and sliced prosciutto if you like. Kurt’s bowl had some prosciutto, but I went a different way with mine. I made a quick cilantro pesto, with cilantro also from HOE, using almonds, garlic, and olive oil. I spooned a bit of this on top of the gnocchi. For both bowls, I sprinkled on some piment d’esplette for color and spice. I know you might not believe this, but it was really good. It was very fresh tasting, and the gnocchi were the perfect addition to the soup. The cheese instantly melted into the top surface, which added to the murky look, but also added a nice salty edge. 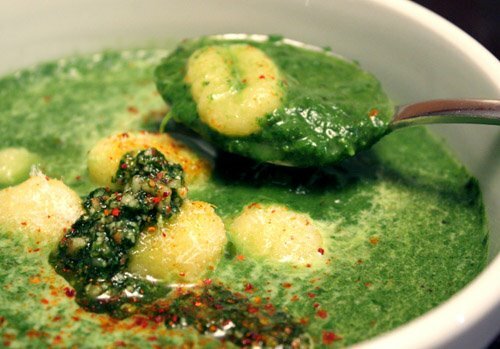 Grow some greens, or find really fresh ones at a farmers’ market, and make a pureed greens soup with gnocchi because it actually is more delicious than it looks. I don't know what you are talking about, I think it looks gorgeous! And I can just taste it - earthy, sweet, and delicious. Love it! That photo is so vibrant. Love the idea of using gnocchi in a thick soup. We think this looks great! Anything this green means vibrant and healthy. It looks wonderful and I love the gnocchi it in! Yum! What gorgeous color! Something I'll have to try soon. I love these photos! and I am a gnocchi lover now. Beautiful. what a vibrant photo & color! Love what u did here. You have not put me off, just the opposite - this soup looks fantastic! That "green goo" looks really delicious to me! I love these bowls of green goo! They are so creative and delicious. I love the land of the lost! I used to watch it every Saturday morning, they must of been reruns because it was many years past 1974. I didn't know they were making a movie. It looks incredibly rich in color and texture, and the gnocchi finishes it off perfectly. Both of your variations look and sound delicious to me! I also kind of like the idea of gnocchi in a soup! Although you think it looks like green goo, I bet the taste was great!!! Mmmm I have to make some gnocchi this month and I was trying to find an original way to serve it... this is awesome! I would love to try this! PS, I'm making the White Bean and Zucchini Puree tonight and I am SO excited to try it! I'm making it w/o the truffle oil, though. Do you think it would still be ok? Teanna: Thanks! The white bean puree is definitely still great without the truffle oil. It just gilded the lilly. MMMMM...Lisa!! This is soup sounds excellent!! Yummie food! I adore the idea of the gnocchi in the soup!! Thanks again for your lovely & cool émail, my friend! seriously though, i think the color of your concoction is stunning--it doesn't scare me away at all! in fact, i think it's a pretty elegant dish--bravo! What a gourmet soup! An interesting and original combo! Yummy! I actually think this looks really good! I love gnocchi...such a great recipe, love the combination of flavors that you have and the pictures as just amazing. I think your soup looks really pretty. I've had my eye on a somewhat similar recipe for watercress soup, just haven't made it yet. Unbelievably beautiful to look at, and I am sure it delicious too. It's funny that you think it doesn't look good. I think it looks and sounds great. Green is my favorite color and something I strive to eat a lot of. Thanks for this unusual but appetizing recipe. BTW, do you know where I can find a good, hearty vegetable stock recipe? Nikki: Thanks! I have admit, I don't really follow a recipe for vegetable stock. I tend to make it from whatever I have on hand. And, I often save vegetables in a bag in the freezer once they're looking tired and use those for stock. One trick to making a stock richer though is to roast the items to be used before covering them with water and simmering. If you use some extra onions and roast them first, that could add a nice hearty flavor to the stock. The color is gorgeous!I've never put gnocchi in a soup but really like the idea. Gnocchi any way is a good thing in my book! Absolutely stunning! There's nothing that compares to that pesto-fresh shade of green -- and it always makes my stomach growl. I'd have to skip the prosciutto, but I'm good at adapting recipes to my vegetarian/pescetarian ways. I've also been on a gnocchi kick lately, so I'll add this to my mounting pile of wanna-make recipes. Thanks for the tips on vegetable stock! Are you kidding me? This looks delightful. It's soooo vivid looking. It's a beautiful bright green that makes me think of eating something healthful and spring-like.